Watch video of Ben Smith’s keynote speech and discussion from ISOJ 2018. 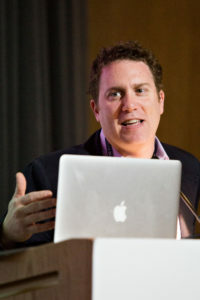 If you’re trying to do good reporting in 2018, you have to push back on the deluge of distorted information coming out of the White House and its media allies, said Ben Smith, BuzzFeed‘s editor-in-chief during his April 14 keynote speech at the 19th International Symposium on Online Journalism. But dealing with these institutions’ organized efforts to discredit serious journalism work is not a simple task. “You also need to resist the mindless reflex to become their mirror image and imagine that your job is to resist rather than to report,” Smith added. He said that was what BuzzFeed’s Adolfo Flores did while he was on the ground reporting on a caravan of Central Americans headed to the United States to seek asylum while President Trump was mischaracterizing the movement. “I can’t think of anything crazier. Adolfo sitting at a breakfast place in Oaxaca eating pancakes — oddly enough — and seeing on television the president lie about what was happening around him. How do you not have a panic attack?” Smith asked. “To be clear I haven’t heard of anyone being raped in or around the caravan,” Flores tweeted at the time. Even though BuzzFeed is still the world’s leading cat GIF site, the organization has increasingly developed a reputation for its high quality original reporting under Smith’s leadership. Prompted by Evan Smith, CEO and co-founder of the Austin-based Texas Tribune and chair of the discussion, the editor-in-chief is fiercely proud of the work of his staff of over 300 reporters and editors. He defended BuzzFeed’s decision to publish, in January 2017, a dossier with unverified allegations about ties between Russia and then-President elect Donald Trump. While other news outlets chose to hold back, BuzzFeed’s move drew intense criticism in the media and political worlds. “A year later, I haven’t had anyone come up to me and say, ‘I wish you hadn’t published that. I would have preferred to stumble through the year of 2017 totally confused, not knowing what was going on,'” he joked. But he was fascinated when BuzzFeed’s founder Jonah Peretti showed him that, from that moment on, information was going to travel online via social media — a new concept back in 2012. “The goal of the media company was not solely to build a destination site, but primarily to make media that people would share,” Ben Smith explained. He wouldn’t reveal the costs of BuzzFeed’s media operation or the revenue it generates despite Evan Smith’s persistence. But Ben Smith said the company’s businesses model has evolved throughout the years: while advertising remains the main source of revenue for the website, BuzzFeed has started to take on new revenue streams, such as commerce and product deals. However, he didn’t hide his admiration for Tasty, the organization’s popular cooking video channel, which is now selling branded kitchen products as a source of revenue. Although BuzzFeed has grown to be an online media powerhouse, they don’t have it all figured out.